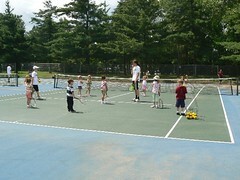 When I was growing up the neighborhood kids used to play tennis a lot. At first we would simply hit the bouncing yellow ball around the street in front of our houses. 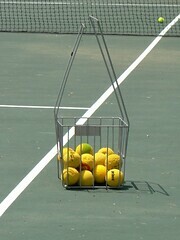 As we got older we bought more sophisticated tennis rackets and started to play on actual tennis courts. My brother and I used to go to play for fun during the summer months and would have a great time. Several weeks ago NHL came home from school with the paper advertising a program called 15-Love. I had heard fabulous things about 15-Love and was intrigued. They actually have a beginner programs for children that are 4-6 years old. From their website: " 15-LOVE’s mission is to serve inner-city youth, ages 4 and up. 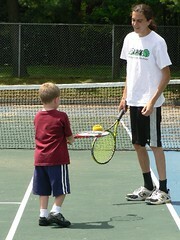 We welcome everyone, of every background and tennis ability, including summer lessons for adults." The program for kids is 30-60 minutes once a week and at a park close to where we live. It seemed like a nice option to add to NHL’s summer. Last week we went to the first session. I was floored with how many children showed up. 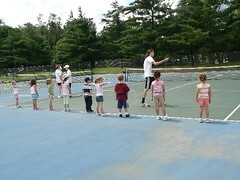 It was a nice sized group of 4-6 year olds, plus a lot in the next age group. Clearly 15-Love had done a great job getting the word out about their program for the kids of this area. NHL was very excited. 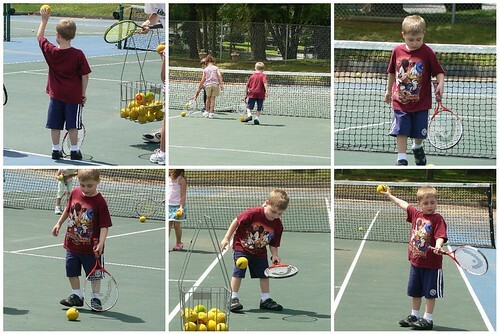 He has never played tennis before, unless you count using the Wii. 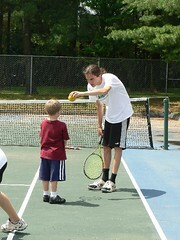 He quickly ran onto the court to learn all about tennis. The kids did some drills where they walked the tennis ball "dog" up and down the court, dribbled the ball with their rackets and listened to the instructors. The instructors were fabulous. They were patient with the kids, really explained things in child friendly terms and they were not afraid to work with the kids when they were frustrated with an activity. At the end of the hour NHL declared that he loved tennis. He talked about going to buy his own tennis racket. I asked him if he was excited to come again and he said he could not wait! Of course JSL may have a different opinion. The little guy was definitely bored just watching everything going on. 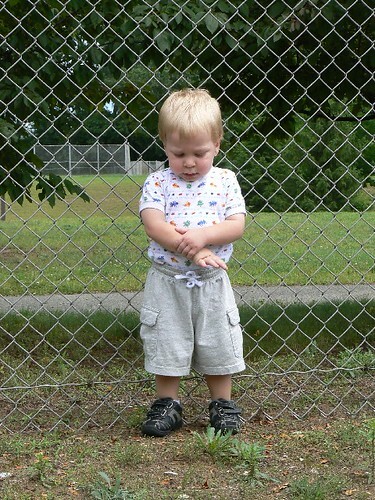 Eventually he got out of his stroller and found a stray tennis ball that kept him amused …along with his shadow. This week I will definitely bring some items to keep JSL entertained more while NHL is out on the court. I do not want to see this little face pouting again. That looks like a lot of fun and what a great way to get your kids interested in exercise. My parents play tennis all the time and growing up there was a tennis court right across the street. I wish I knew how to play or had the opportunity for my kids to learn. Now this is a very cool post! lovely pictures and so bright and colorful! Jennifer’s last blog post..Increase Your Traffic! Blog Hop!